Yesterday morning it rained in London. Many of you know that I love the rain. I made a cup of tea and started work with a smile on my face. Atticus, my cat, also loves a rainy morning since he loves to sleep. He likes any day really as long as he can stretch out on his bed and snooze. While Atticus was perfectly content with the rain, my dog, Miles, was not happy. He hates the rain. Miles refuses to go outside even if it is barely raining. However, once the last drop has fallen he is ready to go out and explore. 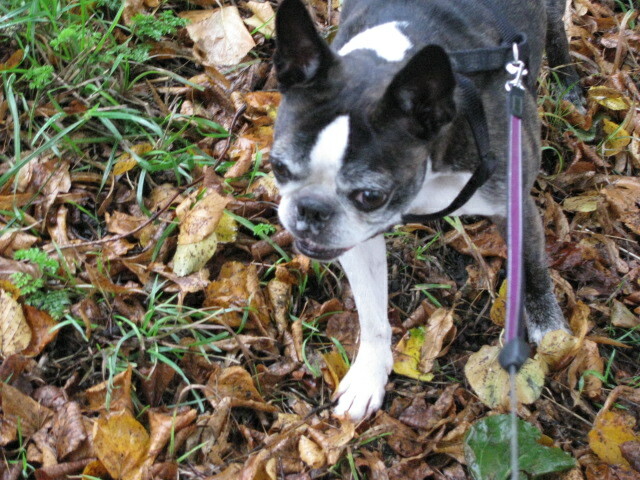 He doesn’t mind puddles, mud, wet leaves, or anything just as long as no drops are falling on his head. 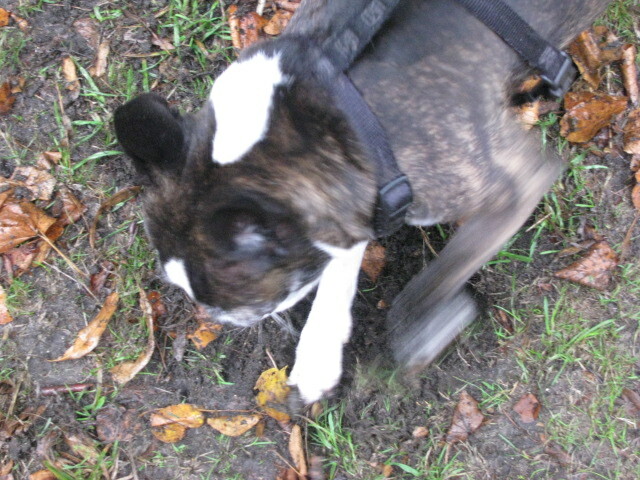 One thing that really makes him happy after a rain is digging in the mud. It must be a dog thing. He loves it though. And Att, he was happy to stay inside and sleep the day away. This post is for the Weekly Photo Challenge:Happy and for Ailsa’s Travel theme: Animals. This entry was posted in Travel Theme, Weekly Photo Challenge and tagged 50 Year Project, Animals, Boston Terriers, Cats, Dogs, Life, Photo Challenges, Photography, Rainy Days, Travel Theme, Weekly Photo Challenge. Bookmark the permalink. That is so cute. Mine are the other way around. The cats hate going out in the rain. Jackie actually growls if I make her…Chevvy doesn’t really mind. I wish it was the other way around here. It would make things easier with Miles since he has to go outside to use the restroom. If I’m not careful, he’ll try to lift his leg without actually stepping outside. I learned that the hard way. Atticus has a growl too! And it scares me. No you don’t because you wouldn’t believe the places cats can pee in if they don’t go out. Charlie was caught opening the saucepan cupboard and going in and peeing in a frypan. I kid you not !!! My two HATE kitty litter for some reason. I know I shouldn’t laugh, but I’m totally picturing that. Seriously, I don’t know what I would do: laugh or get mad. Thank goodness Att doesn’t mind kitty litter because that would be hard to live with. Oh Charlie! Animals have so much personality. Oh, I started And Then There Were None yesterday and I’m loving it. I’m almost halfway done. What in the heck is going on on Soldier Island? Too adorable… they look like my animals when the weather is terrible outside. My boys are so spoiled that when things don’t go their way, they pout. I wish I was one of my animals. Pampered! You will die when you find out who is behind it all…how it plays out. Charlie was actually getting cystitis and I didn’t know until later that night when he got really distressed. It was horrible cause I did get a little mad at him then I felt so guilty when I realised why he did it. Apparently when cats get cystitis they pee in the weirdest places. They usually won’t use kitty litter because they associate it with the pain of peeing. They seek out cold surfaces. I read that they will often pee on lino floors and kitchen benches as well. The cold feels good. 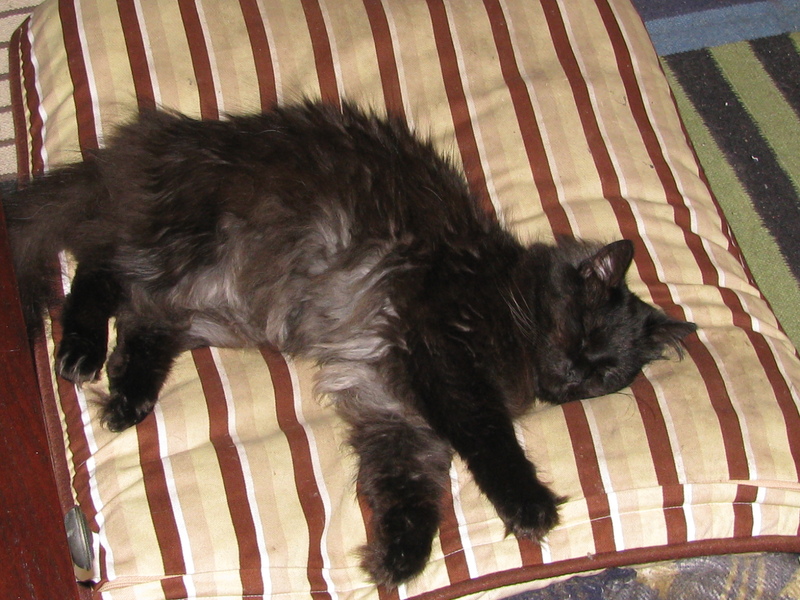 I am really going through a bad patch with the cats – Jackie is sick again. 36 hours of vomiting yellow bile. I hate it when cats vomit – it is so violent. Back to the vets today where he thought he felt a lump near her bladder, so she had to stay. They knocked her out so they could have a good feel [she was tensing up when conscious] and x-ray her. Luckily no mass of any kind. It was a tense few hours waiting for that. Still don’t know why though. She is home – slightly dopey. Not really eating yet though they gave her an injection to help that. But I guess if every time I ate and drank for 36 hours it made me violently ill, I’d be a bit wary of food and water. I am so sorry to hear that Jackie is sick again. I wish I could give her a hug and make her all better. I know when Atticus is sick (he has a urinary disease) I feel so helpless and terrified. And poor Charlie–I hope the cystitis is clearing up. I never heard that they prefer peeing on cold surfaces during this. That explains some of Atticus’s behavior when he isn’t doing well. At one point I had a litter box in every room since he couldn’t hold it for long. I wish you all well and I hope Jackie starts eating and drinking soon. And no vomiting. Take care Jo! I’m sending you positive thoughts. Charlie is all good. I gave him apple cider vinegar – great for keeping their wee parts working well, and is supposed to help keep fleas at bay. I have to hide it in their food as if you give it straight to cats it can make them struggle to breath, Another trick is to put on somewhere they lick [diluted]. I try to do what I can naturally with the fur babies. Thanks for the positive thoughts. We really appreciate them. Of to bed now. Got NO sleep last night with Jackie. Enjoy Agatha !!!! Get some rest. And thanks for the apple cider vinegar tip. I may have to look into that. I have a feeling I won’t sleep much until I finish the novel. Can’t wait to find out what’s going on. I like the apple cider vinegar tip too. Your post on animals brings out the best in us. Lovely. Funny and cute post. What’s with the digging? My dogs used to dig as if they were meant to reach Australia within a day. There was no point, nothing they found or buried just the joy of digging – and the paws when the dirt is wet… Oh cats… They are so amazing at showing you what a great time they have. I wish I could understand Miles more. But I have learned to enjoy life from him. Atticus has taught me how to relax and to let it all go. That was very clever of you to combine two challenge themes, and I love your pet photos. I am so tired after entertaining all weekend that I wish I could be like your cat and just curl up on my bed all day and sleep!!! Atticus is soooo lucky :). Atticus is lucky, not that he’ll ever admit that. I was reading the comments about Charlie—–my first cat, Cypress, got cystitis and peed on the stove top!!!! Did not know it until I turned the burner on……do you know what that smells like???? Not good, let me tell you. Love the pictures of Atticus and Miles—such sweeties! I don’t know what it smells like and I’m pretty sure I don’t want to. My boys say thanks! Yes…that’s when they aren’t bugging me for snacks. You are in danger of turning into a Brit – enjoying tea and rain…it´s a rocky road! They are full of it. There’s one in the neighborhood that is smaller than Miles, but more energetic. My dogs are funny – if it’s pouring down at night (before we go to bed) and I let them out in the garden – they won’t go out. If, however, I’m getting the leads out they’re always prepared to go out! Your dog is cute – what is it? Is it a Frence bulldog?? Miles won’t even go if I try to take him for a walk. He plants his two front feet and won’t budge. 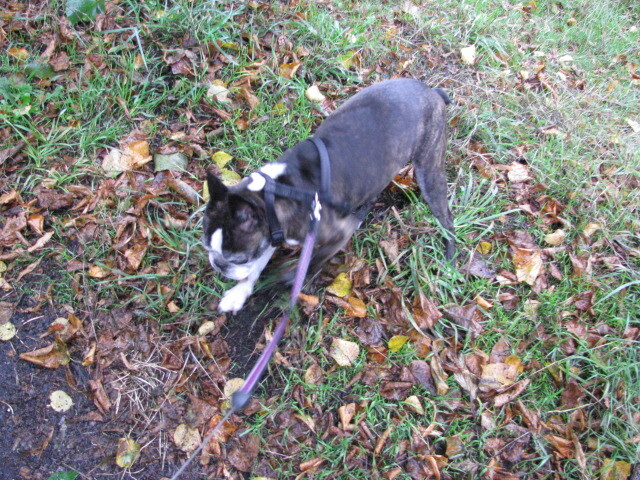 He’s a Boston Terrier–small for his breed. He should be ten pounds heavier, but don’t tell him. He thinks he’s big and strong. My dogs are the same way, especially the little one, she hates to go out if it is even just drizzling. Miles is a cutie. Yep, drizzle is a no go here. I’ with Atticus, a good day for sleeping. 🙂 Our dog would stick his nose out the door, and if he felt a raindrop it was an immediate retreat! Atticus knows how to enjoy life. Right now, he’ curled up on a blanket in front of a heater. Trompie doesn’t mind walking in the rain, it’s me who does not really like it get soaking wet. Trompie even goes to my bedroom afterwards and waits till I blow dry him! Miles loves the snow. The fool will play and play even if he is shivering to death. You seem pretty busy with your travelling, reading and movie watching! When do you get time to work?